ITS 1:22AM AND I AM TRYING TO WRITE A PAPER. I have to say that this movie wasn’t quite as funny as I was hoping it would be. The talent show scenes were my favorite. Especially when the m.c. kept cracking terrible jokes and everyone died laughing like it was the funniest thing they’d ever heard. All in all it was a decent movie, and pretty funny, but was definitely built up too much for me to love it (J.T.). Worth checking out, though. If you are a fan of The Lonely Island, you will love this movie. If you are not, you will not. It’s that simple. Sheena and I both thought it was quite hilarious. There were definitely some parts that lagged, and parts that were too stupid to really be funny, but for the most part it was exactly what I expected. I can’t wait to see it again. Hoobastank. I watched this yesterday after downloading it. It was interesting. I haven’t seen many short films that I thought were amazing. Even one of my favorite movies, Bottle Rocket, started out as a short film, and I don’t really care for it. This was good. Nothing spectacular, but still good. The characters were interesting enough. I think I will like it a bit more after seeing The Darjeeling Limited. I just felt like it was going somewhere (which it is) and just stopped. I guess that’s kind of the point. I, of course, loved the camera shots and colors and everything. Wes Anderson‘s style is so great. It’s free and worth checking out. If you are a fan of Wes Anderson, you already know about the upcoming release of his latest film, The Darjeeling Limited. What you may not know is that Anderson made a short film as somewhat of a prologue to the feature. Unfortunately, the short film will not be playing before the feature in theaters. Fortunately, it is currently available for free download on iTunes. The short features Jason Schwartzman and Natalie Portman, and is called Hotel Chevalier. I’ve heard that it isn’t necessary to see it before Darjeeling, but how can you deny getting to see more from Anderson. And Schwartzman. I just downloaded it, and I’ll let you know what I think tomorrow. Enjoy. For the longest time I doubted the greatness of this song. but this was always that “radio hit” that was my least favorite on the album. that I realized how excellent it really is. But even if it were still just mediocre to me, the video is awesome. Again, Spike Jonze is a genius. what movie is this poem from? Chalk is a mockumentary about school teachers. It’s not really a Christopher Guest style mockumentary. But it’s filmed like a documentary, and it’s fake, so there you go. It’s a good movie, but more so just somewhat humorous and somewhat true. It’s definitely not laugh-out-loud funny, although there were a couple of really funny parts. Even though it wasn’t as funny as a Waiting for Guffman or even Drop Dead Gorgeous, I thought it was a good movie. The only part I didn’t like what the dream sequence. I mean, a real documentary isn’t going to have a dream sequence, so why should a fake one? I think most people would think it was rather entertaining. Check it out if you get a chance. From the producers of Napoleon Dynamite. 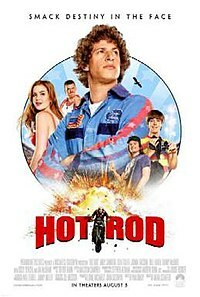 This movie was sort of a “so bad it’s good.” It was somewhat of a mix between Napoleon and Bottle Rocket. But, obviously, not as funny as either. Every review I’ve read about the movie says that it’s terrible. I disagree. It’s by no means awesome, but it’s just good, clean fun. I don’t think I ever actually laughed-out-loud, but there were some humorous parts. I really liked the different characters. It’s just basically dumb fun. It you liked Napoleon, you’ll probably like this, even if just a little. this is one of my favorite music videos. First things first. Last night I went to see Fionn Regan at Workplay with Amanda, Ginny and J.T.. It was a good time. I promised them a shout out on the blog (they are jealous of my skills). This movie is amazing. You don’t even know. This is Wes Anderson‘s first film. It is also my favorite of his. and even their lesser-known, older brother, Andrew (not shown in clip). 1. It’s almost impossible to pick a favorite scene.